Is your bathroom looking a little worn or dated? 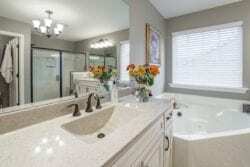 Does your bathroom need just a little update or an entire full remodel. Cabinet Discounters has the expert advice and products you need to help you create the beautiful bathroom you want! For over 30 years, Cabinet Discounters has been helping our customers transform their bathrooms into stunning but functional areas of their homes. Updating your bathroom can be as simple as replacing the flooring, adding a fresh coat of paint or installing new cabinets. The color and style of cabinets, tile and paint all have the ability to dramatically change the appearance and feel of your bathroom. Cabinet Discounters has seven conveniently located showroom locations to help you select the best products for your bathroom needs. Whether you are starting with a clean slate or completely remodeling your bathroom, there are many aspects to consider. As you start your remodelling project, Cabinet Discounters recommends coming up with a list of what you want and what you absolutely must. Browsing the Internet and magazines is a good way to create a list of likes and dislikes for your future bathroom. Not all bathrooms have space for a bathtub. Steam showers and saunas are becoming a popular choice over traditional bathtubs. Do you need more bathroom counter space to accommodate us by the entire family? Or will a pedestal sink meet your needs? When choosing a vanity, you should also consider linen and towel storage. Many customers choose to add additional lighting to their bathroom, such as around the mirror or in the shower. Would you like your toilet to be separate from the rest of the bathroom? Do you have the space for this? There are many other aspects to consider during your remodel such as the height of the vanity, safety elements (such as a grab bars in the shower), adding a shower seat, storage components, and adding towel bars, hooks and a toilet paper holder. Contact our Cabinet Discounters design team to begin planning your bathroom remodelling project today! Our professionals will come up with a comprehensive plan and an installation guide to help you plan and execute your dream bathroom remodel within your budget!